My name is Seth Norell Bader. I recently returned from 4 months spent in E. Africa. While in S. Kenya, I met a man named Francis "Wiper" Nkadayo. Together, Francis and I have founded this project to provide food, clothing, health care, and school fees for orphaned children in the Rift Valley of S. Kenya. This is a Community Based Organization, and a Not-For Profit Organization. ANY DONATIONS WOULD BE APPRECIATED! 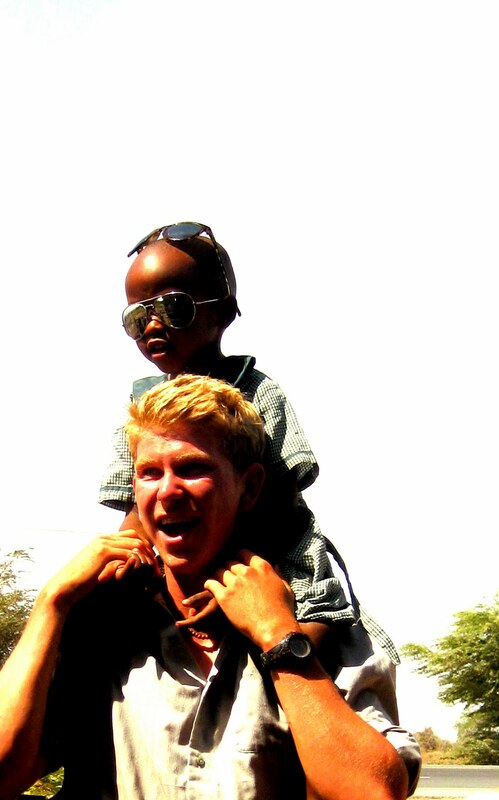 On Saturday I had the most enjoyable, exhilarating, and exhausting day I have had since I arrived in Tanzania. We spent the day doing community service for an orphanage in Mto Wambu. The previous night we decided that we wanted to construct some sort of play structure for the children. Last year SFS built a swing set, and I was really determined to top it, so I started researching construction ideas for a see-saw. The next morning about ten of us began collaborating our building ideas, and there was immediately some disagreement and tension over what we should build. Some didn't think that a see-saw was safe or a realistic structure to make in such a short amount of time (we only had 3 hours before we left for the orphanage), but me and my three roommates (Aaron, Robbie, and Adam) were determined. After several hours of hard work and sweat, we had assembled all the parts to install a make-shift see-saw at the orphanage. At 1:00 we arrived at the orphanage covered in paint and sweat, and met the 18 children and center director. The children were not shy at all; within 10 minutes they were crawling all over us, begging for piggy back rides and to be tossed into the air. For the first hour I spent most of my time digging two 3ft holes which would hold our two post anchor points. After more sweat, paint, and lying in the dirt (I was the only one with long enough arms to continue digging our holes after a while) our see saw was finally finished. Aaron and I gave it the first test run. It held our 300+ pounds, but we defiantly felt it buckling, and I became nervous that the children would quickly and easily break it. As soon as Aaron and I jumped off, every child came sprinting over and fighting for their turns. The children had never seen a see saw before so we had to push them a bit, and teach them how to use it; they quickly got the hang of it. For the remainder of the afternoon the air was filled with laughter and giggling, and not a face went smile less. I was filled up with so much happiness, standing there and watching the children. Never before have I had an idea, put it into a plan, execute that plan, and see its impact and results in less than a day. The entire experience made me feel so competent and confident in my ability to lead groups and manifest my ideas into reality. Furthermore, it solidified and was exemplary of the enjoyment I receive when I dedicate all of my efforts to serving others. Before we left, we sat down with the center director and children one last time. The director spoke with us about how none of the children have any money, so once they finish primary (elementary) school that they will be unable to enter secondary (high school), meaning most of them probably won't receive even a high school education. All they need are a few supplies and uniforms to attend high school, but they don't even have enough money for that. To help out we all bought a few African greeting cards they had made out of dried banana peels, they are very beautiful cards. I also left with them the soccer ball, some paper, colored pencils, and watercolor painting materials. It was heartbreaking to visit a place and make connections with the children, all the while knowing that none of them will ever get half of the opportunities I will; even from the most basic things like clean water, food, and an education. When I think about it, the laziness and carelessness of many Americans infuriates me. We take education for granted. In America, it is assumed and normal that you will graduate high school and go to college. Here, you are lucky to graduate high school, and more likely to be struck by lightning than go to university. I am extremely grateful for the opportunity to peruse higher levels of education, and I think anyone who is not, or does not work as hard as possible to take advantage of their educational opportunities is reckless. Any of the 18 orphans I met would be willing to put their face down to the grindstone and study infinitely if it meant they could go to a university. Alas, they do not have this option. For those of you who are in school: appreciate it, take it seriously, make the most of it, because for many, the opportunities you perceive to be normalcy are the dreams of others. Michael testing the See- Saw. (This boy LOVED it). Last Sunday we had a lot of classes and I finished three assignments that were due on Monday, so I spent most of Sunday studying. I did get to take a study break when I went with my roommate, Petro and Reggi (some local carpenters), and Elias (a guard) into Rhotia. We walked up on a political rally for the CCM party (the most popular political party in Tanzania). Tanzania is electing its president in October, so we essentially watched a campaign. Aaron and I were the only white people there out of 300. Never before have I felt so many pairs of eyes watching me all at once. The rally was unlike anything I have ever seen in America. People were swinging from trees, standing on top of cars, speakers, and each other’s shoulders to see through the crowd. Speaker Rep. for CCM Party. Rhotia, Tanz. On Monday we traveled to Tarangire National Park for another game drive. This time however we spent the first three hours driving transect lines and performing large animal counts, from which we will make posters addressing the density of mammal species in four different habitats. Tarangire is about three times as large as Lake Manyara NP, so we quickly were separated from any groups, and drove around for two hours without seeing anyone else. Some highlights from are drive were three animal carcasses (zebra, elephant, giraffe), three cheetah, one female lion, a group of 19 elephants, an Eland, and many large Baobab trees. We drove back to the field station in Rhotia, and we were greeted by the staff, almost as if we were coming home from a long trip away. Elephant Carcass. Tarangire NP, Tanz. The highlight of Tuesday was when I realized I had three jiggers (burrowing sand fleas) in one of my big toes. The only way to get them out is with a needle, so with about half the camp crowded around watching me by the campfire I removed all three. Each of them popped like a zit from a 13 year old, as a larvae sack would surface followed by the jigger itself. Everyone was screaming and laughing- it was crazy. Later today I will go into Karatu to explore a bit more and meet with a local man named Henrey about climbing Kilimanjaro in December, but for now I need a nap…I haven’t been getting enough sleep. I hope all is well…HAPPY 23rd BIRTHDAY AMANDA!! I am here to laugh, dream, learn, love, share, serve, and explore.